I drink water habitually; my trusty water bottle shows some serious wear and tear. When I bring it to meetings, I often receive comments on how it looks like it’s had a long life! It’s important for me to stay hydrated—especially on these hot summer days—and I feel fortunate that I can fill it up with safe, publicly-sourced, tap water. In other words, I have never had to worry about how my water might not be safe. But, this is not a reality for many people. The importance of drinking tap water has become a common message these days, especially in public health campaigns to decrease obesity or cavities. It’s a simple and readily available way to replace excessive calories consumed in juice, soda, and other beverages. However, promoting tap water has become more complicated with situations like we see in Flint, Michigan, with high levels of lead in public drinking water. Low-income communities and communities of color tend to have higher rates of obesity; there are many reasons for this, but many of them have to do with how our institutions and public policies have limited their access to healthy foods and safe recreation opportunities while targeting them for sales of unhealthy, sugary food. However, these same unjust institutions and policies have also led to these communities living in areas where the lead content is likely to be higher. So while drinking more tap water might help these communities lower their obesity rate, they have to risk their life and health to do it. Something as simple as water is connected to a larger web of health inequities. 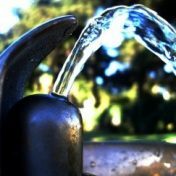 Lead and toxins in drinking water leads to issues in children, namely in lower IQs, anemia, slowed physical and mental growth, and hearing issues; in pregnant women, in slowed growth of fetuses; and in adults, in terms of cardiovascular and kidney issues. These health challenges, which disproportionally affect low-income communities and communities of color because of substandard housing, create a serious disadvantage—one that is hard to overcome, and may make us less likely to trust our water. But not drinking enough water is also a health risk. When water consumption is low or at risk of declining, there is an increased concern about oral health issues. Publicly-sourced water has naturally occurring fluoride, which strengthens teeth, and by replacing soft drinks with water, the risk for cavities decreases. So it’s a balancing act. When Delta Dental set out to increase tap water consumption in Latino communities last year, they had to overcome fear and mistrust about its safety and health. And, this past legislative session Colorado passed HB-1306, which will give public schools water testing resources, but could also reinforce community fears about tap water. The health risks of water issues are clear. What is also clear, is who these water issues hurt the most. As we’ve seen in Flint, the political will to ensure that drinking water is safe for everyone, even if it costs more, is lacking. As we encourage Coloradans to make healthy choices, we need to ensure that the infrastructure is safe for them to make those choices. It’s said that water is life; we should all have a right to life, liberty, and the pursuit of safe, healthy water.